Converting funds from one currency to another is a core part of the international payments process. A set of APIs has been created in order to offer full control of the conversion process, from the quoting to the creation, the update, all the way to the cancellation of a conversion. 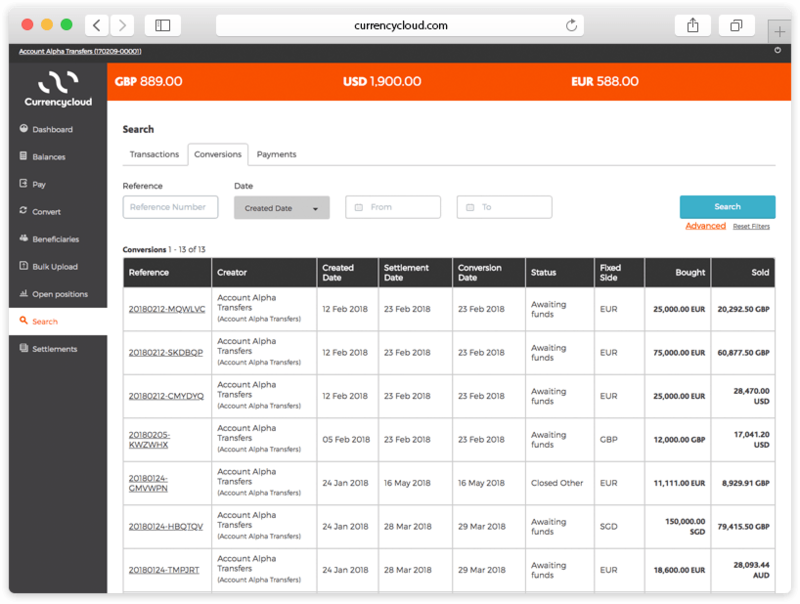 This functionality is available to the users with the relevant permissions and can be accessed through Currencycloud Direct at any time, beyond normal business hours. This guide focuses on the conversion split process, including split preview. Conversion split is a feature driven by permissions and is only available for House Account level users. Users with this permission can split a conversion into smaller amounts both in their own account as well as any of their sub-accounts. The feature is available both for users that are enabled or disabled for Currencycloud Account Balances. Note that only conversions that are in status “Awaiting Funds” can be split. 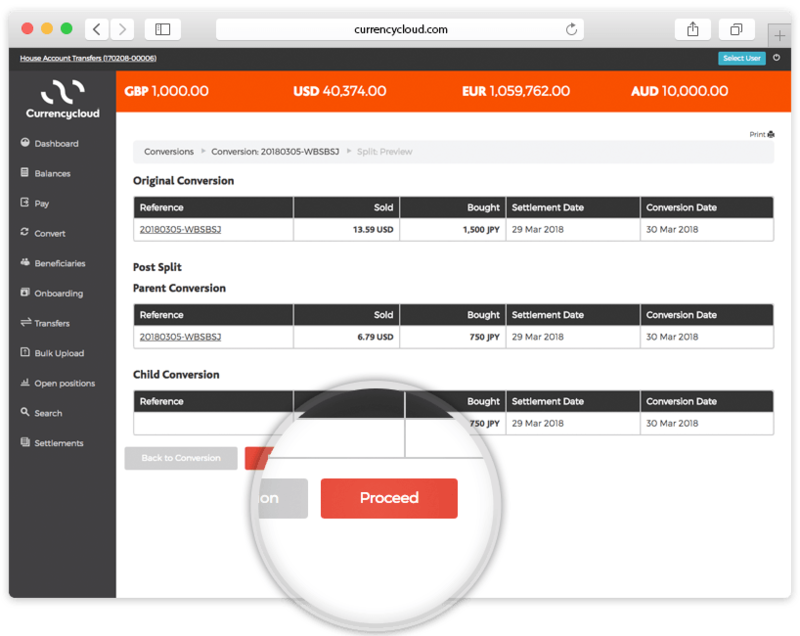 By combining the split functionality with the cancellation and date change features, the user can complete more complex actions like partial cancellations, partial rolls or partial drawdowns. Click to see the details of the conversion. 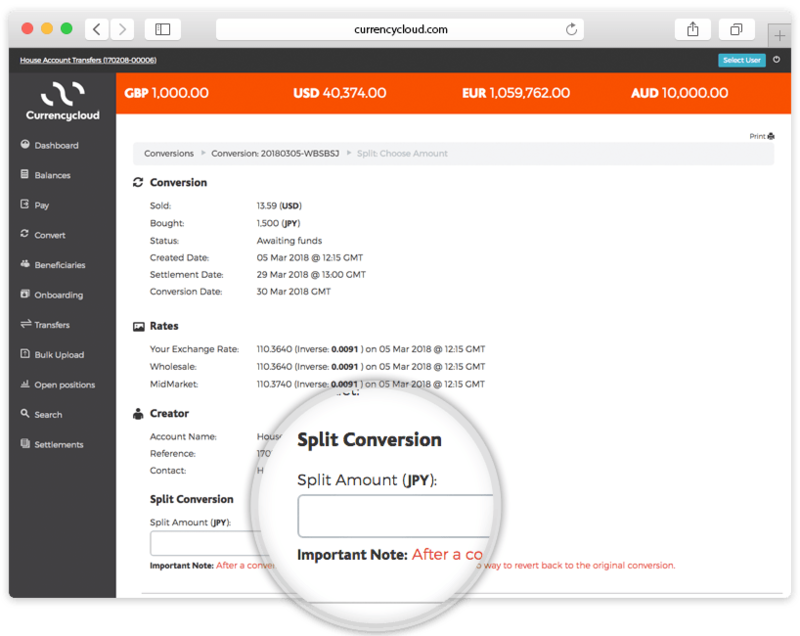 If the conversion is in “Awaiting funds” status and the user has the relevant “Conversion Split” permission, a “Split” button is available on the bottom of the screen as shown in the example below. 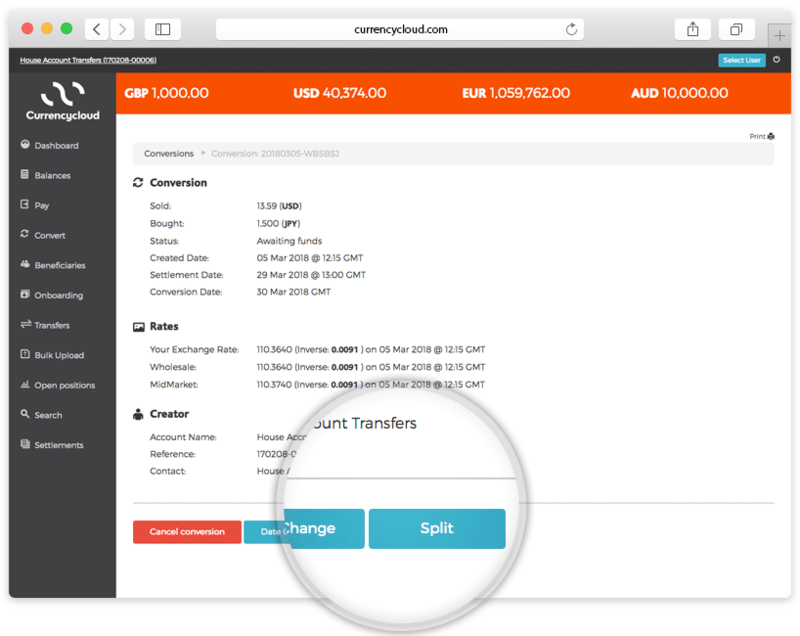 By clicking on the “Split” button, the user gets to a new page where they can define the amount to be split out of the conversion and get a preview of the conversion split. 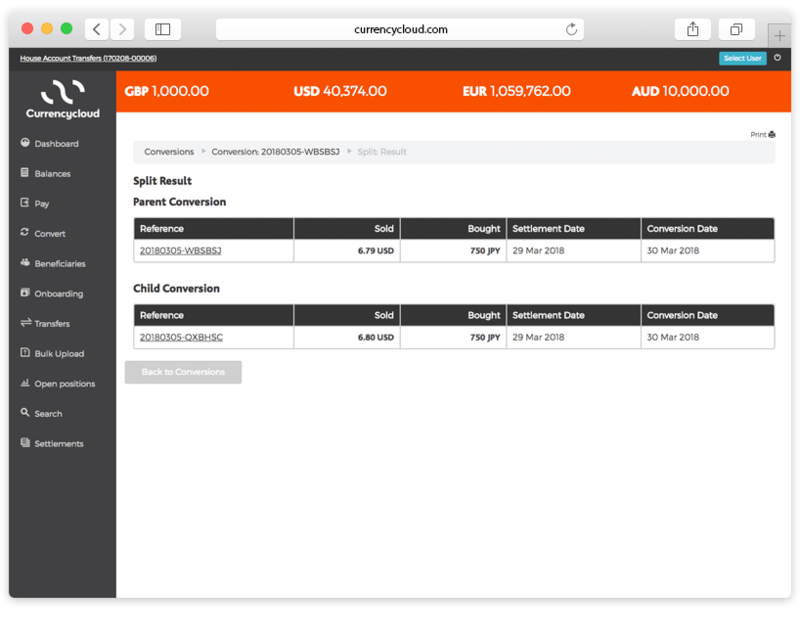 By clicking the “proceed” button, the conversion split is executed, and the result is shown on the screen as the Child Conversion with it’s own ID. In case that a deposit is required for the Parent Conversion, there should always be enough funds left to cover for this deposit. Please note that if at the time of the split there are sufficient funds on the balance to settle the Child Conversion, and the settlement date is the current date, then the Child Conversion will be settled immediately. If there are not sufficient funds on the balance, or the conversion is due on a future date, then the Parent Conversion is settled prior to the Child Conversion.